Five Children and It combines eleven stories that Edith Nesbit wrote about five siblings who discovered a wish-granting fairy called The Psammead in the sandlot of the house they recently moved into. The stories were originally serialized in shorter form in Strand Magazine in 1900. The first story (the first chapter of the novel) tells how the children moved from London to Kent, explored their new house and yard, and found the Psammead. He grumpily agrees to grant the children a daily wish that will end at sundown. Each chapter tells the story of a single day, how the children wish for something, and how it goes wrong. Usually they wish for something obvious like beauty or money, but sometimes they accidentally wish for something they didn’t really want granted, such as when Cyril carelessly wishes that his baby brother would grow up. The consequences are always unexpected and usually quite awful, and the children have to get themselves out of the situation they got themselves into, often at a cost that leaves them poorer than they were before they made the wish. It’s all rather funny and there are many lessons learned. The take away message is to be careful what you wish for! I love Edith Nesbit’s stories — they’re still as humorous and wonderful as they were over 100 years ago. They’re delightfully old-fashioned. For example, the little boys play outside in coats and ties and have to roll down their stockings to show off their bruises. 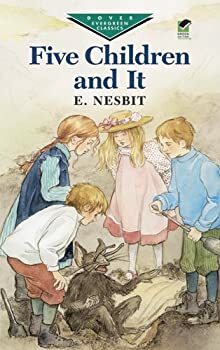 Nesbit is an intrusive narrator, often offering commentary and amusing insights about the characters or their predicaments and sometimes making polite suggestions for the reader’s own behavior. I thought the book was charming and I think it will appeal to any modern reader, child or adult. Five Children and It has been adapted into anime, comics, a BBC TV series and movies, and several children’s authors have expanded upon the concept in their own novels. Nesbit also wrote some later stories which included the Psammead. Five Children and It is easily found for free online since it’s now in the public domain. I listened to the audio version read by Johanna Ward who is absolutely wonderful. I got this book for $3 by “purchasing” this free Kindle version and then using the Whispersync feature to purchase the audio version. If you do likewise, make sure you’re getting Johanna Ward’s narration. There are others, but I doubt they could be better. It does sound charming! I’ve heard of this title before, and now I know what it’s about. Thanks, Kat.